Planetbeing, a member of the evad3rs hacking team, has announced that they've achieved unsigned userland code execution on iOS 7. Achieved unsigned userland code execution with some of our stuff in reserve. Now we have a good platform for poking the kernel. Basically this means that they've got behind Apple's walls of security and now can poke at the kernel. Bugs found in the kernel could be used to create a jailbreak for the new operating system. 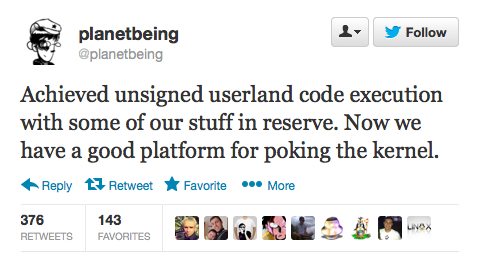 Yesterday, the team announced that they were investigating iOS 7 GM seed to see which of their exploits still worked.